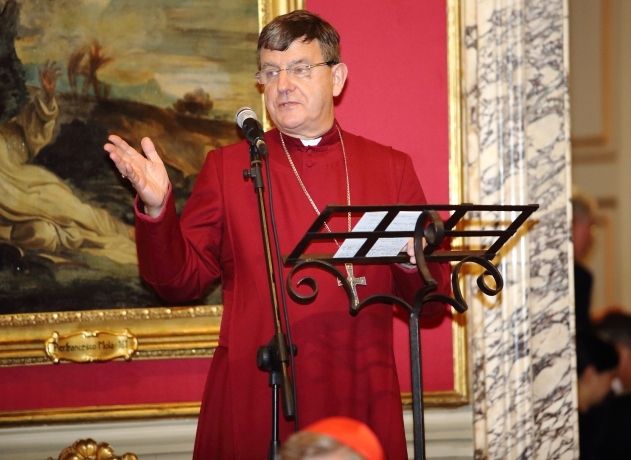 Last week the Governors of the Anglican Centre in Rome met in the Eternal City, as it does every November. This meeting was particularly poignant for me as I was bidding the Centre farewell after serving as a governor there for three decades. Fiumicino Airport, like all airports, seems to be in a state of continuous rebuilding, but for me it is so familiar that it's one place where I never get lost! Thirty years is a long time to be involved with any project, so how come the Centre magnetises people to itself? Where did it originate and what's the point anyway? This year's a perfect moment to ask that question, as we have celebrated, amongst other things, the canonisation of Pope Paul VI. For it was the chemistry between Giovanni Battista Montini and Michael Ramsey that set the Centre upon its continuing pilgrimage. In 1966 when Ramsey, as Archbishop of Canterbury, paid a momentous visit to the Holy Father. Six years earlier, Ramsey's predecessor, Geoffrey Fisher, had met with Pope John XXIII. It was the first visit of an Archbishop of Canterbury to a Pope since that of Thomas Arundel in the final years of the fourteenth century and so the first such visit since the Reformation. At the time the Vatican did as much as they could to muzzle the press and keep the encounter quiet! Since that momentous meeting, the Centre has gradually increased its outreach and its place of honour in Rome. A remarkable selection of individuals have acted as director - Australian, Canadian, English, New Zealand and now Burundian. Also, with extraordinary graciousness and generosity the Doria Pamphilij family, one of the most long established and distinguished families in Italy, have given the Centre its home in their own palazzo on the Corso, close to the Vittorio Emmanuelle monument at the very heart of Rome. Principessa Donna Orietta began the association with the Centre and her successors Principessa Gesine and Prince Jonathan continue to be wholly supportive of all the Centre's work. The Rt Revd Dr Stephen Platten retired as Chair of the Governors and the Anglican Centre, after three decades as a governor. He was awarded the Lambeth Cross for Ecumenism by Archbishop Justin Welby last week.